The residents of Spanish America were divided by, and at times fascinated by, ethnicity. While people distinguished and explained differences among themselves in a variety of ways, they also relied upon visual culture to play a role in defining—and often repressing—these distinctions. The idea of “ethnicity” is, of course, of recent coinage. 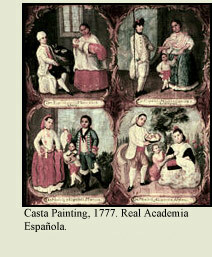 In Spanish America, blood lineage was one of the most important criteria for distinguishing among people. Portraits of wealthy individuals—be they Spaniards, Creoles or native elites—often recorded genealogical information alongside the sitter’s likeness. People in Spanish America also subscribed to a hierarchical model of society, with different castes ranked into an ordered system. Beyond this, at least in theory, individuals were also divided into two “republics,” one Spanish, the other indigenous. In reality, however, social order never adhered to such neat categories. Within nine months of the arrival of the conquistadors, the first mestizo children were born—sons and daughters of these foreigners and native women. In the decades following, more and more mestizo children were produced by marriages, informal liaisons, casual affairs, and rapes. People with fully European ancestry would also be born in the Americas (known as Creoles), as would those of African and Asian descent. Yet in numbers, if not wealth or status, native people and then mestizos were dominant. 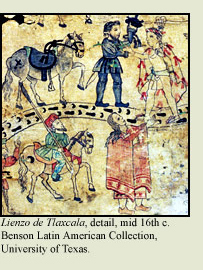 The word, mestizo, commonly carried negative connotations in colonial Spanish America. In the 17th century, for instance, a Spanish dictionary defined mestizo as a mix of different species of animals. By implication, it was a trespass of the order of nature: if Spaniards defined “pure” or “noble” blood as good, then they considered its dilution, or loss of purity via mixing, undesirable. 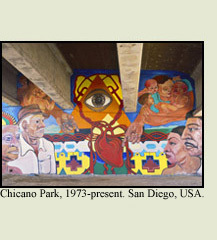 Yet the meaning of mestizo has hardly remained stable over time, as this 20th-century Chicano mural suggests. Throughout the colonial period, the elites of Spanish America, be they Spaniards or Creoles, called those of Spanish/indigenous descent mestizos, and viewed these people as members of society who, although filling city streets and town squares, challenged ideal concepts of the social order. By the 20th century, particularly after the Mexican Revolution, mestizo came to carry positive meanings—after all, the majority of Latin American nations were peopled by mestizos. The words mestizo and mestizaje share the same root, and therefore a similar history, yet mestizaje is the primary concern here. This is the larger phenomenon, continuing today, of the great ethnic and cultural amalgam created, not just by Spaniards and native people, but by generations of immigration and social interaction in Spanish America. Consequently, the mestizaje of the 21st century includes not only people of European and indigenous descent, but also those from Africa and their children born in the Americas. Beginning in the 15th century Africans and African Americans became integral members of Spanish American society either as freemen or slaves. And by the 17th century, they could be found in almost every region in the colony. As the populations of cities burgeoned, people of different ethnic origins came to live at close quarters, and their interchanges, both sexual and social, were creating a dynamic new society. 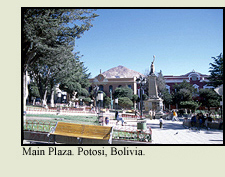 Public plazas, squares, parks and markets became sites for all kinds of social and economic interaction. While people in Spanish America would never have used the term mestizaje to describe their own objects and buildings, it provides an important interpretive framework to foreground the potent and ongoing interchanges between people of different ethnicities—which ranged from the tumultuous to the unremarkable. Since a person’s political and social power were enmeshed with his or her ethnic identity, examining mestizaje also demands an analysis of power relationships. In order to illuminate how such interactions left their trace upon, or were themselves shaped by visual culture, this section emphasizes the role of ethnic difference in the production and use of objects, images, and physical spaces. 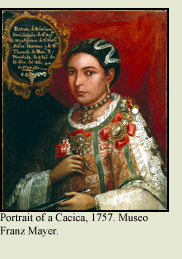 Images that explicitly depict mixed populations, or the historical figures who created the first mestizos of the Americas, like Hernán Cortés and Doña Marina, are important in the examination of mestizaje, but such paintings and drawings are not the only sites where visual culture conjoins with ethnic difference. Indeed, looking at visual culture through the framework of mestizaje allows 21st-century viewers to see things about Spanish America that were often implicit in, or not commented upon by people of the past. This Taíno zemi offers one example. The zemi’s material composition—local Caribbean fiber, Venetian glass, and African rhinoceros horn—could only result from the interaction between traders from Europe and Africa, Spanish conquistadors, and Taíno inhabitants of the Caribbean. While it is unlikely that the indigenous man or woman who crafted this extraordinary work did so with “mestizaje” on his or her mind, the experience of cultural interchange among peoples of different ethnicities is nonetheless embodied in this object. Today mestizaje is a frequent focus of 21st-century histories of the colonial past. 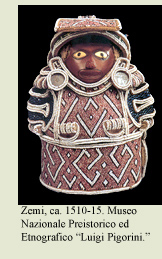 For the connections among Africa, Europe and the Americas which take material form in this beaded object are the very connections that give the history of Latin America its unique narratives. This rift—in which people in the past dealt with genealogical information and ethnic interaction in ways quite distinct from today—is central to Vistas. Certainly the significance and use of objects in the past lent visual culture an important set of meanings, but not the only set. Current narratives and trends, like the development of ethnic studies since the 1960s, shape the questions asked today. 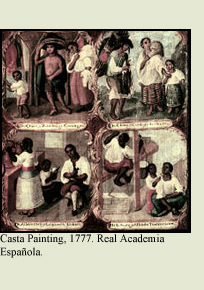 So too do desires to understand historical practices associated with the modern terms “race” and “class.” For instance, casta paintings, of which this image is a detail, comprise a whole genre of 18th-century paintings describing the ethnic admixtures in Spanish America. While casta paintings have been the subject of several recent books and exhibitions, they were almost invisible in art histories of Spanish America written before 1960, and only a little is known about what 18th-century viewers made of them. As 21st-century interpreters, we are thus bound to the colonial contexts of images and sites, but we are also bound to present concerns. This tension is part of the reckoning that this section seeks to address. In many instances, such reckoning yields rich results. 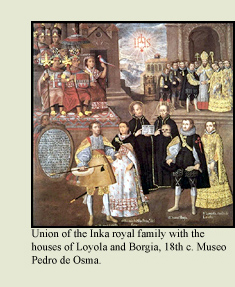 The concerns of past viewers about mestizaje are evident in this painting from Cuzco, which portrays the 16th-century marriage of an Inka princess, or ñusta, to a Spanish conquistador, and the later wedding of their mestiza daughter to another Spanish grandee. Notably, the mestiza at the far right has lost the physical markers of an indigenous identity. Her skin is pale, her dress and posture European in style. Through its visual language, the painting implies that the religious ritual of marriage creates a mestizo lineage in which assimilation is nearly seamless. This lesson might have been instructive—or encouraging—for the painting’s original patrons, but for 21st-century viewers thinking about the power dynamics of mestizaje, the scene raises other questions. For instance, what political and physical powers were exerted to create a society in which a marriage such as this one could take place? And what does it mean when a painting glosses over the daily experience of such power, power which would have been keenly felt by the wedding participants? In the realm of architecture, interaction among people of different ethnicities was clearly marked in practices that translated to physical or material terms. For instance, convents are usually thought of as female retreats devoted to enriching the spiritual lives of their inhabitants, but they too were shaped by ethnic hierarchies and exchanges. Many convents had small cells for the mestiza and mulatta servants who served the Creole nuns living in more spacious quarters. Some convents were meant for only well-born mestizas, but their relative lack of financial resources, and therefore size and architectural importance, reinforced the presence of ethnic hierarchies to all city dwellers. 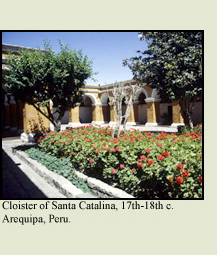 In monasteries, the murals of the lower cloisters were often aimed at the indigenous students who entered there, while the murals of the upper floors were meant for contemplation of European or Creole friars. Architecture, as well as other forms of visual culture, thus created and reinforced ethnic distinctions. Reckoning with mestizaje often means looking “below the surface” or “beyond” the obvious physical features of an object or site. 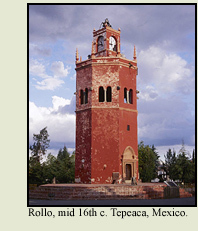 This tower was raised nearly five hundred years ago in a small Nahua community in New Spain. The style of the Rollo, with ogee arches and octagonal plan, harkens back to models of Islamic architecture. Yet the tower came into being only through extensive negotiations among peoples of different ethnicities and the labor of native people who never met an Islamic architect. Thus the lens of mestizaje brings to this building an understanding of both the visible and invisible aspects of ethnic interchange in the colonial world. And in so doing demonstrates how mestizaje’s relationship to visual culture is a complex and revealing way to reckon with the past.